This walk winds its way up through a pleasant forest of oaks and pines, before continuing up the ridge of the Loma de San Juan, from which you have panoramic views of the Sierra Nevada. The climb is fairly relentless, and steep in parts, but if you’re reasonably fit and the weather’s good the amazing scenery more than makes up for it! 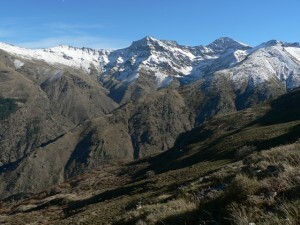 Return via the attractive Cortijo del Hornillo and the lower part of the Vereda de la Estrella. Level This is a tough climb, with over 1000m of accumulated height difference. 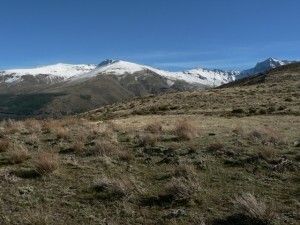 One section of the route is difficult to follow as there is no clear path, so a map and compass or GPS is recommended. This section is also quite uneven underfoot, so we recommend wearing good walking boots and taking a walking pole. For an easier to follow and less strenuous alternative, see version A of this walk. When to go Spring and autumn are probably best for this walk, to avoid the heat of the summer and potential risk of snow in the winter. It would also be possible in summer if you start out early enough, but it could be very tough going up the hill. Water There is no reliable source of water available on the route, so make sure you take enough with you (1-2 litres per person, depending on how hot it is). 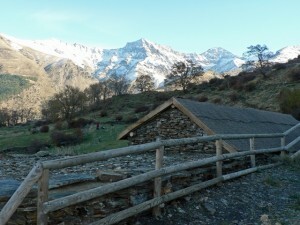 This entry was posted in All Hikes, Autumn, Güéjar Sierra, Hikes, More than 5 hours, NW Sierra Nevada, Spring and tagged Sulayr. Bookmark the permalink.